Here are Family Travel, we’re focused on helping families get the most out of their family time. We make it easier for families to get out and explore more, experiencing the best of a destination (whether that’s down the road or around the world) and making memories that will last a lifetime. Family Travel helps families book and plan trips and things to do that their whole family will enjoy. We do this by sharing expert stories about the best family-friendly activities, events and destinations as well as insider tips, reviews and videos from local kids and families. We also offer great family holiday competitions and share the best family travel deals we can find. Families can explore the website by searching for places to go, things to do, top travel stories and holiday deals. We publish a quarterly eMagazine, Family Travel, that’s designed for families who enjoy sitting back and delving deep into travel stories. 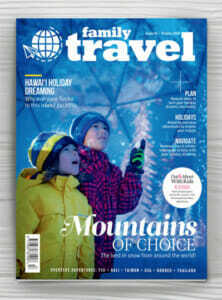 Our mag is packed full of ideas and inspiration for things to do and destinations to visit for all family types.